SodaStream shows you how to become a better version of yourself with a Pfff and a Psss and in its latest commercial. 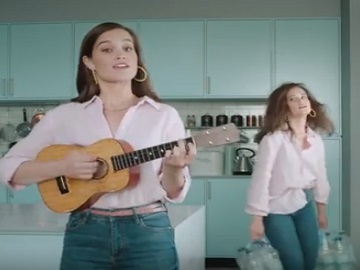 The 20-second spot features a young woman with a small guitar, revealing, through a song, the “secret” of how she became a better version of herself with a pfff and a psss, which consists in three steps: buy SodaStream, stop wasting your time on schlepping and storing and enjoy some time for yourself. As she says/sings that, another version of herself, who buys plastic bottles and has difficulties handling them, is seen. When the latter joins the better version, all ruffled, and is complimented for the way she looks (she’s told “You look amazing”) while being handed a glass of water, she answers “I woke up like this”. Her better version also hands her a hairbrush while uttering, unconcinved, a “Yeah”. The commercial ends with the voiceover saying the brand’s tagline, “better for you, better for the planet”. Over the years, the Israel-based manufacturing company has enlisted several celebrities to star in its advertising campaigns, such as Scarlett Johansson, who quit her ambassador role with Oxfam after the charity criticized her for appearing in a SodaStream commercial, Mayim Bialik of “The Big Bang Theory” and Kristian Nairn of “Game of Thrones”. The last two actors co-starred, in 2017, in an environmental global campaign launched dubbed “The Homo-schlepiens,” which aimed to highlight the evils of single use plastic bottles and encourage people to reduce their plastic footprint.